Anyone in quality control would recognize the name; more people in business will recognize the principles. Joseph Juran, who made “Six Sigma” a symbol of high quality control and pointed the way to statistical analysis of problems that factory floor workers could understand and use, is dead at 103. Among his best-known works were the “Quality Control Handbook” in 1951, the first mathematically rooted textbook on product quality, now entering its sixth edition, and “Managerial Breakthrough” in 1964, which described a step-by-step improvement process that inspired the Six Sigma and lean manufacturing philosophies. 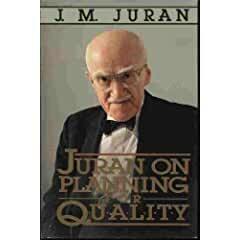 Perhaps a mark of how far out of favor serious quality control has fallen, the New York Times article makes no mention of other quality control pioneers who worked with Juran, such as W. Edwards Deming, nor does it note the amazingly long list of companies who used the principles to achieve greatness, some of which were later skewered by other economic problems. And I’ll wager that not one school principal in 1,000 knows who Juran was or how his methods might improve education. This entry was posted on Monday, March 3rd, 2008 at 6:29 am and is filed under Business, Economics, Education, Education quality, History, Quality. You can follow any responses to this entry through the RSS 2.0 feed. You can leave a response, or trackback from your own site.